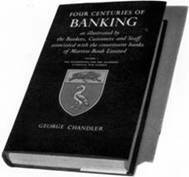 Most of the Twentieth Century sees the exponential growth of branch banking in the United Kingdom, but the final decade begins to reveal the inevitable results of fifty years of computerisation, including the centralisation of back office functions and massive reductions in the numbers of those employed. At least one generation of older customers is cut adrift by a sophisticated - and still ongoing - campaign to make people use the internet, so that high street branches can be closed with the legitimate excuse that “customers don’t use them any more”. That everything in twenty-first century banking is mired in scandal and the culture of blame, hides unfairly the pioneering efforts of banks such as Martins to promote high quality service as the most desirable aspect of having a bank account. A banking service of one kind or another has been offered on the site of 68 Lombard Street since 1563, when Sir Thomas Gresham is said to have traded “at the sign of the grasshopper”. By 1918 on this site, Martin’s Private Bank has its London Head Office and there are fourteen branches dotted mainly around the Kentish/London border. 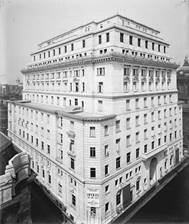 Under the Chairmanship of Edward Norman, Martin’s Private Bank is acquired by the Bank of Liverpool and renamed the Bank of Liverpool and Martins. 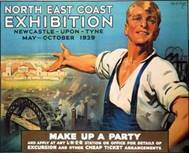 The North East coast Exhibition of 1929 is one of the first opportunities for the new Martins Bank to make its presence felt. A stand at the show is rented from May to October in the “Palace of Industries”. Even contactable by telephone, the stand runs as a mini Branch of the Bank and thereafter Martins cannot resist taking part in everything from the Annual ideal Homes Exhibition at Olympia, to the British Industries Fair, and the Shoe Trades Exhibition. The Bank’s lavish stands often win prizes. Exeter Branch is destroyed in the famous Baedecker Air Raid in April 1941. 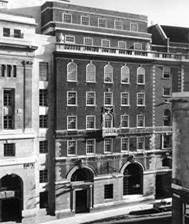 It is one of a number of casualties suffered by the Bank around the Country during the Second World War – 32 Lowndes Street London, 19 South John Street Liverpool, and Manchester Corn Exchange are amongst those destroyed by enemy action. Meanwhile an “army” of female members of staff is temporarily promoted to run Branches and sub-Branches whilst the male staff are away fighting in the Second World War. Many of these women take on the responsibilities of Clerk in Charge, and maintain the vital service of providing cash for local people and businesses in the days when a bank was almost the only way to obtain it. Between 1939 and 1946, many more branches are closed either for the duration of hostilities, or permanently. Finance for Farmers and Growers is a unique collaboration between Martins Bank and the ministry of Agriculture. It is published in 1955 shortly after food rationing in the UK is abolished. This annual summary of trends in farming, and the ways in which it can be financed, is an immediate hit, and continues to be produced by Barclays until the late 1980s. 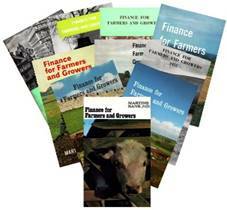 Published for more than thirty years, Finance for Farmers and Growers now provides us with a detailed historical record of the changing face of farming in Britain. Martins Bank acquires Lewis’s Bank Limited, a unique banking enterprise for its size, with branches inside department stores. 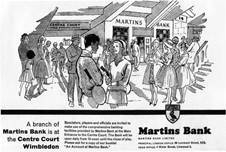 This briefly provides Martins Bank with its first (and only) branch in Scotland. Lewis’s Bank opens all day Saturday, and runs a dedicated children’s counter in each of its department store branches to encourage thrift in the young. 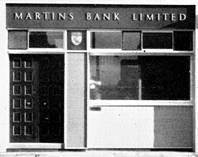 Martins Bank owns Lewis’s for nine years, before selling it on to Lloyds Bank in 1967. For many years Lewis’s Bank has a branch at the top London department store Selfridges, because Lewis’s Stores actually owns Selfridges during that time. Martins Bank becomes the first Bank in the UK to successfully demonstrate the day to day processing of its customers’ current accounts using an electronic computer. Trials of the british made “Pegasus” Computer are run in Liverpool and London, and extensive research into marrying together the processes of the Branch Counters and the Back office is undertaken by Martins’ Head of Organisation research and Development, Ron Hindle, who visits the USA and Sweden in search of the expertise and equipment that will deliver computerised banking. 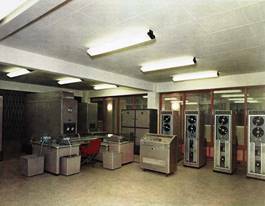 Originally the size of a room, the Pegasus computer can process the details of 30,000 accounts, yet its memory capacity is less than you might find today in some children’s toys. Beryl Evans becomes Martins Bank’s first female appointed member of staff. She takes on the role of Assistant Manager of the Bank’s Advertising Department. 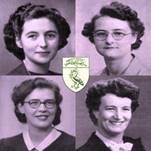 Beryl has been involved in all aspects of Head Office life, and has also taken part in, or planned most staff social events since the late 1940s. She leads by example, turning her hand to just about anything to help maintain the success of the Bank. Under her leadership the advertising department takes a much needed and radical step away from the staid and boring, and embraces the surreal and swinging 60s head on. Martins Bank opens a second drive-in Branch at Epsom, Surrey, serving what the Bank refers to as “the gin and Jaguar belt”. Epsom Branch is opened in a former police station, and stands in its own grounds with ample space for a drive-in window. The branch is built at the insistence of one of Martins Bank’s Directors, whose wife has expressed embarrassment at not having a local Branch of the bank at which to cash her cheques! The Epsom drive-in remains open until 1979, with the branch itself closing a couple of years later. The Unicorn brand is originally partly the creation of Sir Edward DuCann MP, whose “Unicorn Securities” Company is re-branded Martins Unicorn, in 1967. Martins Bank acquires Unicorn Unit Trusts, which along with the profitable Martins Bank Trust Company branches around the country, will provide lucrative income opportunities for Barclays for decades to come. 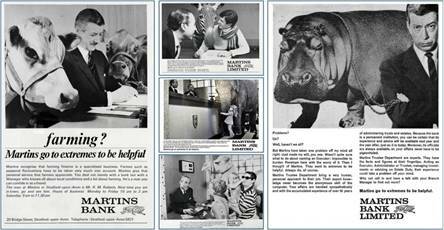 Martins Unicorn is the subject of the Bank’s one and only television advertisement, which airs in three regions of the newly reshuffled ITV network in October 1968. 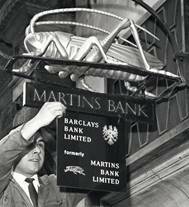 Martins Bank unveils the first cash dispenser in the North of England at Liverpool, Church Street Branch, in October 1967. 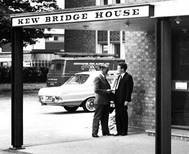 Although Barclays opens the World’s first cash dispenser in Enfield, Middlesex some five months earlier, it requires the use of paper vouchers and a six digit personal code number. Martins Auto-Cashier is the first dispenser of its type in the World to use the combination personal identification number (PIN) and a plastic card that we know today. At first these machines operate on the principle of pre-payment, something which has come back into fashion in the twenty-first Century, through prepaid debit cards. Manufactured by the CHUBB Safe and Lock Company, the second generation of this machine wins a Prince Philip Design Award in 1969. 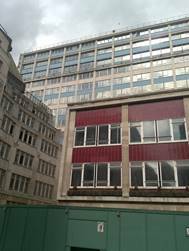 Martins Bank’s original Branch at 88 Wigmore Street London is closed, and the business moves to a futuristic building at No 95 designed by Ernö Goldfinger, who is well known for visiting his dystopian visions upon UK towns and cities. 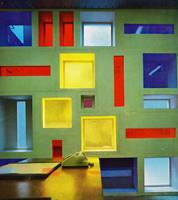 The strange arrangement of blocks on the right is actually the window of the Manager’s office (seen here from the inside), a positive RIOT of colourful glass. By Special Act of Parliament, Martins Bank Limited and Barclays Bank Limited are merged. Despite reassurances by Martins’ Management to their staff, it seems the name of Martins will not live on. - The name of the business will be Barclays Bank Limited, and the words “Martins Branch” will appear on the cheques of some former Martins customers, and on other items of stationery. 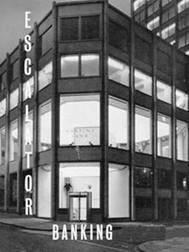 The merger of the main business is all but complete on 1 November 1968. 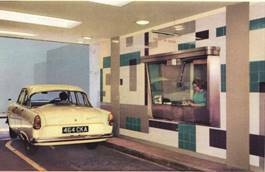 The date for the full incorporation of the branches themselves is set by the Act of Parliament as 15 December 1969. Some thirty-nine years after merging with Barclays, Martins Bank Limited is finally wound up in the records of Companies House. The name cannot now be reused to trade with, by anyone, unless they are recognised and licensed AS A BANK by Companies House. 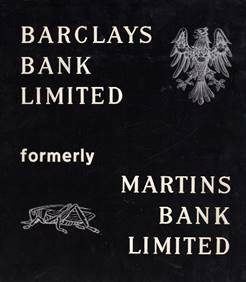 This should safeguard the name of Martins, but given the twenty-first century fashion for resurrecting the names of defunct banks to create new brand loyalties, who knows if Martins Bank will make a reappearance on the high street? part of the Barclays Group of Companies. Celebrating four hundred and fifty years since a banking service first began on the site of 68 Lombard Street London, more than one hundred and fifty Martins Staff gather to celebrate at London’s Royal Overseas League. 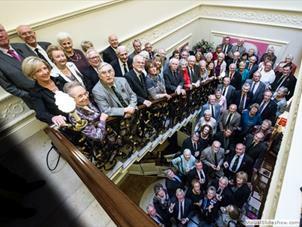 A commemorative tie is produced to mark this milestone anniversary, and nearly three hundred are sold, showing the affection with which Martins Bank is still held by its former employees and customers. Whilst a number of banks can claim to be instrumental in the introduction to the World of the “hole in the wall”, the honour of being first rests with Barclays by exactly eighteen weeks. Like so many other originally simple ideas, the notion of using a bank when it was closed was irresistible, and sparked a race, which fifty years on leaves us with a device that is taken for granted and used all over the World millions of times each day. 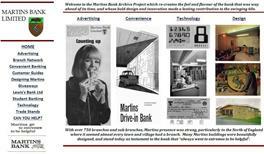 Martins Bank was never one for resting on its laurels, and like Barclays, it enjoyed being “first” with many banking ideas and technologies. 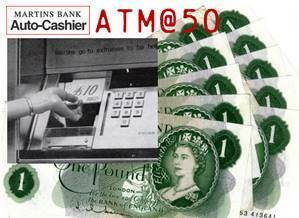 Following hot on the heels of Barclays’ “Barclaycash” machine (27 Jun 1967), Martins Auto Cashier (31 Oct 1967), the first type of cash machine to use a plastic card, was unveiled as the first cash dispenser in the North of England.